The TLM150 is used to sense levels of gasoline tanks using ultrasonic technology and transmit the gasoline levels over the NMEA 2000® network. This allows you to observe gasoline tank levels anywhere on the vessel where there is an NMEA 2000® compatible display such as the Maretron DSM250. The TLM150 is capable of sensing gasoline tanks up to 24" (0.61m) in depth. It must be used only for tanks containing gasoline. Unlike most tank senders that only work with rectangular tanks, the TLM150 can be calibrated for irregular tank shapes so you know the true level of your tanks. The TLM150 can be mounted on tanks with a SAE J1810 5-hole mounting pattern, or to tanks using 1.5" NPT or 1.25" BSP threaded openings via available adapters. The TLM150 has an optional focus tube to allow use on boats with planking hulls when the vessel spends a significant amount of time with the bow pitched up. 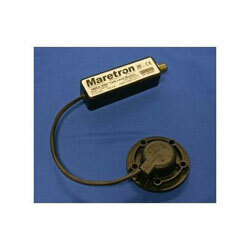 The Maretron TLM150 is designed to operate within the harsh demands of the marine environment. However, no piece of marine electronic equipment can function properly unless installed, calibrated, and maintained in the correct manner.